- Blair Barstar (left) and Greg Williams beautify the corner of Wood and Third streets. - Matt McMillan unloads boxes with his girlfriend, Marissa McSheffery, at the Greater Washington Area Food Bank. - Savannah Dorsey rakes leaves from a homeowner's yard. - Hailey Moninger paints the dugout at the California Youth Baseball field. - The women’s soccer team works on a house on Green Street. Like many basements, the one at the California Area Public Library was in some desperate need of spring cleaning. The borough of California paid for a bin to collect the contents, but the manpower to haul the stuff out of the basement was another matter. The “angels” — 25 Acacia fraternity brothers — arrived around 9:15 a.m. 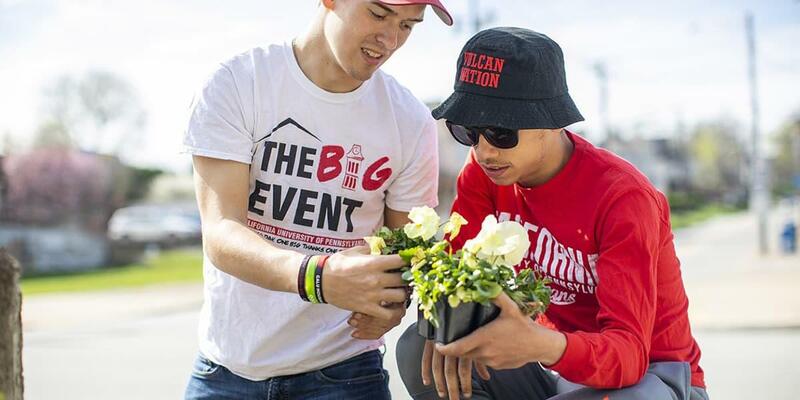 They were among the 489 student volunteers who fanned out throughout California and neighboring communities to pitch in as part of the Big Event on April 13. 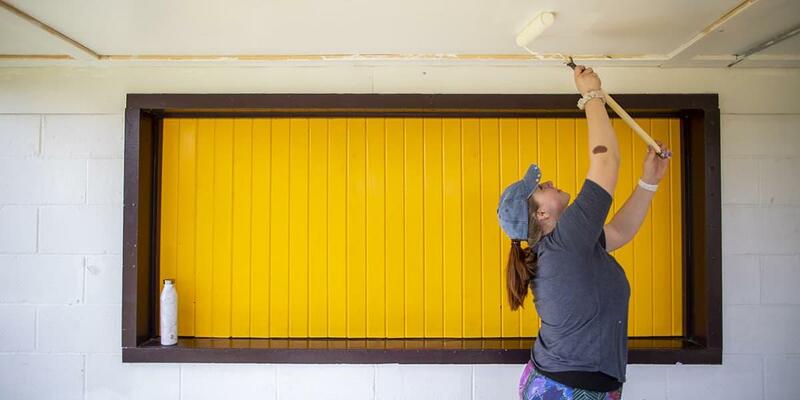 Cal U’s annual program matches student workers with owners of businesses, organizations and private residences who could use a little help with chores such as painting, cleaning, organizing and generally sprucing up. This year, 36 sites were on the to-do list. “It’s nice to see familiar names on the list, but we also had a nice blend of new locations,” said Diane Hasbrouck, director of the Center for Volunteer Programs and Service Learning at Cal U.
Library board member Larry Papini was on hand to help with any “trash vs. treasure” decisions as student hauled out items such as card catalogs, plywood, screens and a projector out of the basement. “I like how we’re here on the weekend using our free time to help the community out,” said Paul Wible, a first-year sport management major. On Green Street, 13 members of the women’s soccer team scraped and painted a house. Seventy members of the football team spent the morning cleaning up Phillipsburg Cemetery. On Pennsylvania Avenue, 15 Sigma Kappa sorority sisters painted dugouts, the concession stand and benches for California Youth Athletics. “We never have time to do this part because we’re always so focused on getting the fields and equipment ready,” said Jennifer Todd, treasurer for California Youth Athletics, a baseball and softball organization that includes 148 boys and girls ages 4-14. Across the street, homeowner Betty Copenhaver was grateful for five Sigma Kappa members who were washing windows and raking leaves. 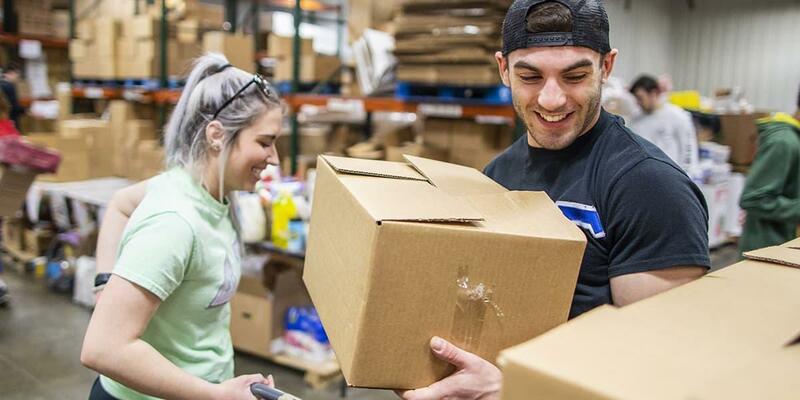 Forty students, from Delta Zeta and Sigma Tau Gamma, helped at the Greater Washington County Food Bank. They sorted clothing donations, packed nearly 200 boxes for area families, helped to organize the facility’s training kitchen and prepared 15 raised beds for planting. “It’s great to have generational volunteers, to see young people caring about our future,” said Jodi Gatts, administrative assistant and program director of the Healthy Habits Training Center. 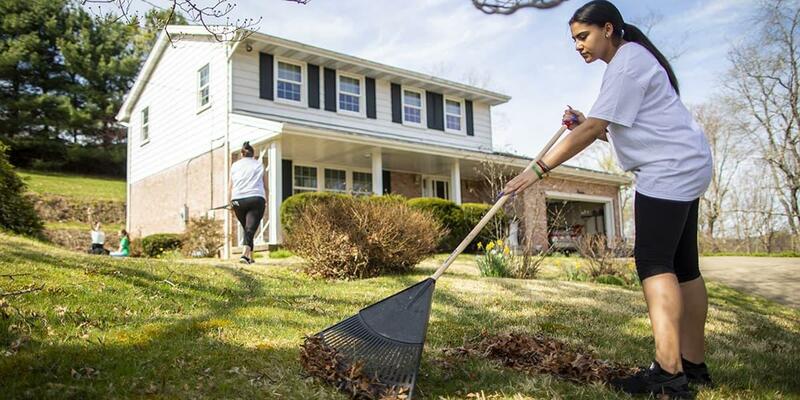 Members of the Criminal Justice and Medical Interest clubs helped homeowner Linda Cairns with yardwork. “It would have taken me five months to do what they did this morning,” Cairns said.